By LUDWIG VON KOOPA - Thoughts on everything Pokémon, going back decades. The central narrative here is what Pokémon Company Tsunekazu Ishihara says at the beginning: Pokémon GO has apparently been downloaded over 800 million times. Try to wrap your mind around that enormous number. It absolutely dwarfs the number of people who have interacted with any other Pokémon medium, be it the games, manga, cards, anime, whatever. That's crazy, but also very unfortunate. I'll get into why throughout this article, which is handily divided into sections! 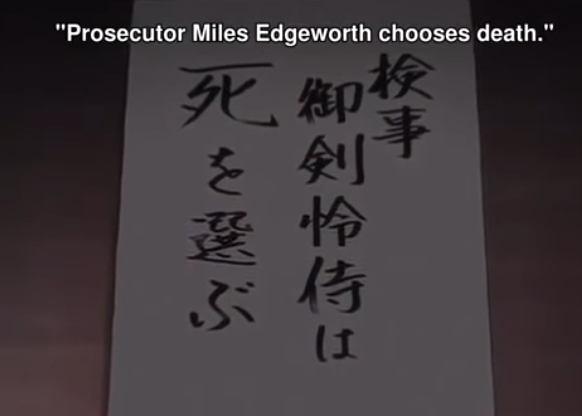 By LUDWIG VON KOOPA - Memorial for Miles Edgeworth. By LUDWIG VON KOOPA - eSports continues to approach the ultimate stage, but this isn't it. Did you know that Microsoft is the Premier Partner sponsoring the 2018 Special Olympics USA Games? They want you to know that, because it helps make them look like a socially responsible company. To that end, Microsoft is hosting the first-ever videogame tournament that is taking place at the Special Olympics — this July 2nd in Seattle. KoopaTV will not cover it. We'll have our monthly newsletter instead. By LUDWIG VON KOOPA - Boycott the Berry Big Circus! If there is one thing that KoopaTV doesn't tolerate (and... there isn't just one thing), it's when people denigrate African countries. By LUDWIG VON KOOPA - These two events conflict with one another. Which should KoopaTV react to... LIVE? Check this out. I'm putting together the schedule for KoopaTV's inevitable E3 2018 coverage. That's important to plan in advance, since the Electronics Entertainment Expo in June is always KoopaTV's most trafficked month. Part of that is because we publish more in that month than the other months, and part of that is because that's when gamers are the most hungry for our content. In the interest of transparency, we have a conflict to present: On June 11, starting at 6:30 PM Eastern, Nintendo will be running the Splatoon 2 World Championships semi-finals. On June 11, starting at 6:00 PM Eastern, the PC Gamer magazine will be hosting the PC Gaming Show. That's a clear time conflict, and based on last year's PC Gaming Show lasting 105 minutes, they're going to overlap. Which do we pick to live react to? On one hand, this site doesn't cater to PC gaming. We're significantly more focused on console gaming. We also don't consider the PC Gaming Show to be an E3 conference, hence why it doesn't end up on our conferences tier list every year. On the other hand, the Splatoon 2 World Championship semifinals is totally without consequence. There is no news that will be announced in there. Splatoon 2 is already out and has been for some time. If they want to drop an announcement for it that won't already be at Nintendo's presentation, they'll do so for the FINALS on the 12th. We haven't even been following the qualifier rounds, so it's not like we'll feel like we're missing anything. Plus, the non-Ludwig staff has demonstrated their boredom with watching competitive Splatoon during last year's Splatoon 2 World Inkling Invitational Championship. If we miss the PC Gaming Show from its live broadcast, we can and probably will go back and still react to it. There WILL be news in there, even if the staffers don't personally care about it. Some other KoopaTV staff members also believe the PC Gaming Show will be funny. If we miss the semifinals of the Splatoon 2 tournament, we're not going to watch its video-on-demand. It'll be lost forever to us. 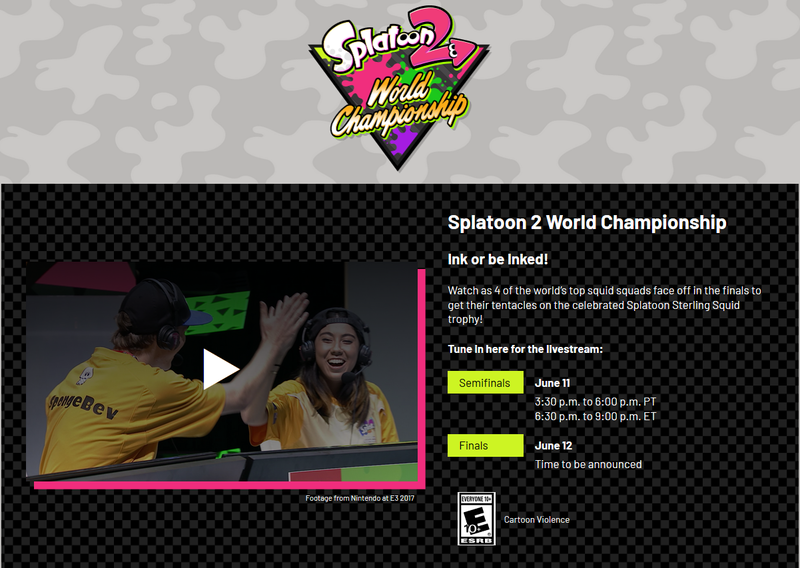 The other reason that the Splatoon 2 World Championship semifinals is somewhat compelling here is because it gives context to the finals round that we'll watch on the 12th, and because all of the Splatoon articles tend to get a high level of interest from readers. (Also known as: Splatoon consistently gets views and engagement on KoopaTV.) It also affects our rating for Nintendo's E3 2018 performance. We're leaving it up to you guys, our readers, to tell us what to do three weeks from now. THREE. WEEKS. UNTIL E3 2018! KoopaTV's staffers have a DIVISION for what to do, so the staff decided to just let you guys decide. Don't expect this level of transparency in the site's decision-making to carry over to many other areas of staff debate, such as the Game of THAT Year awards. For Nintendo's full E3 2018 plans (as we know them as of May 21), click here. The Splatoon 2 World Championship was announced here. By LUDWIG VON KOOPA - Represented by the epitomes of fake. There has been a rash of FAKE NEWS in the past week. I have an ethical policy of not writing opinion articles on FAKE NEWS because I don't like giving garbage any of my royal credibility. The only thing that's more of an annual recurrence than the pre-E3 massacres are the pre-E3 “leaks”, which is an inaccurate way of saying FAKE NEWS. They're unsubstantiated rumours at best. It's only a leak if it's actually true but wasn't supposed to be released to the public. Anyway, it's also unfortunate that the mainstream media is joining the pre-E3 FAKE NEWS, though on non-E3 topics. This time, they're not only spreading FAKE NEWS by themselves, but they are aided by allies, like the Democrat Party. No one is more complicit than the United States Senate's Minority Leader, Senator Chuck Schumer of New York. 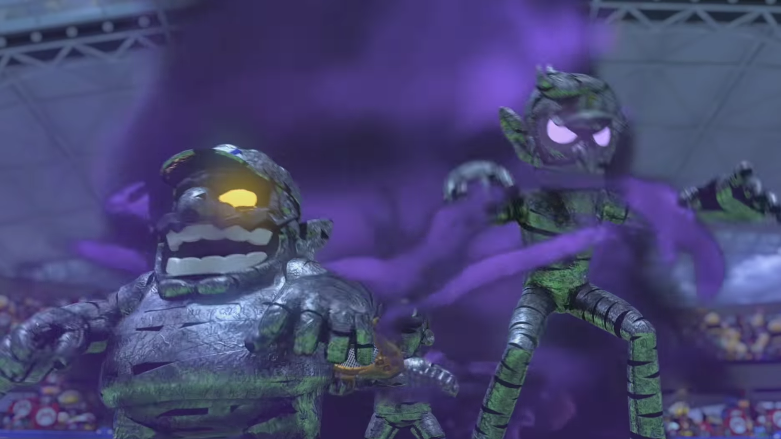 By LUDWIG VON KOOPA - Will Mario Tennis Aces continue Camelot's cinematography? People might be sleeping on Mario Tennis Aces, which may or may not be a shame. We don't know for sure yet since it releases next month, but based on what we saw from it back in the March 2018 Nintendo Direct, we should give it the benefit of some doubt. It has a story mode, after all. Camelot isn't on the best streak of quality gaming lately (no one cared about Mario Sports Superstars, and Mario Tennis: Ultra Smash cared more about amiibo than making a game with personality), especially not compared to their heyday. But Mario Tennis Aces has the potential to turn that around. Mario Tennis Aces obviously has cutscenes in it because of its story mode. This has a lot of potential to bring back the magic last seen from Camelot over a decade ago. Let's go over a brief timeline of Camelot's credibility-building cutscene wonderfulness... featuring embedded videos! Teenage Mutant Ninja Turtles Splatfest Part 3: Raphael vs. Donatello! By LUDWIG VON KOOPA - The loudest sigh, and the final round. This Saturday, May 19th, will be the conclusion of this three-round Splatoon 2 Splatfest tournament based on everyone's favourite Teenage Mutant Ninja Turtles. In Round 1, I supported Leonardo over Raphael. Raphael ended up winning. In Round 2, I supported Donatello over Michelangelo. Donatello ended up winning. Can you guess who I will support in Round 3? That's right. Donatello. I already explained why I dislike Raphael and like Donatello in the previous articles. Does that mean this article is over and done with? No. I'm going to tell you about why I've been sighing and detesting this entire Splatfest tournament series. By LUDWIG VON KOOPA - We explain family group/membership logistics, and why Nintendo allows it. 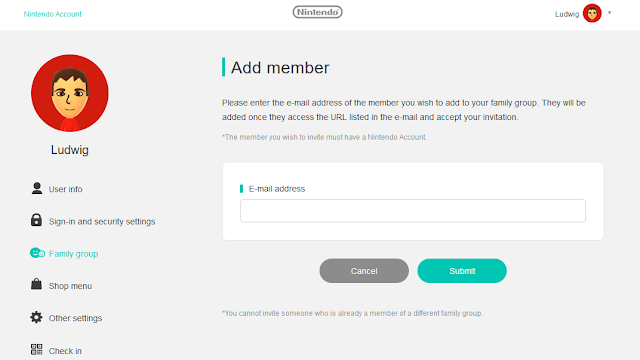 Last week, I set aside Nintendo's family groups as worthy of their own article when discussing Nintendo Switch Online. That is because, starting today (May 15), you can set up your own family group! If I know the e-mail address you registered your Nintendo Account with, you can join the family! Set up a family group here. The family group is a very cost-effective way to have multiple people in one plan. I'm a big fan of how they have an eight-member maximum. That's just enough for King Bowser Koopa and all seven of the Koopalings! ...Bowser Jr. shouldn't be playing online anyway. By LUDWIG VON KOOPA - The .org really does stand for dot organic? Welcome to the KoopaTV fifth anniversary article! KoopaTV started our Internet existence on May 12, 2013. It's now five years later, and we're still around! I tripped over the bananas, too, so there's a possibility I'll end up with amnesia. In the meantime, we have some banana-related delicacies to share! By LUDWIG VON KOOPA - This is a new demo! But are my thoughts on it new, too? Let's get one thing out of the way: Nintendo just released a new demo for its failing fighting game, ARMS. This is completely different than the ARMS Global Testpunch, a dreadful experience that I wrote about here. 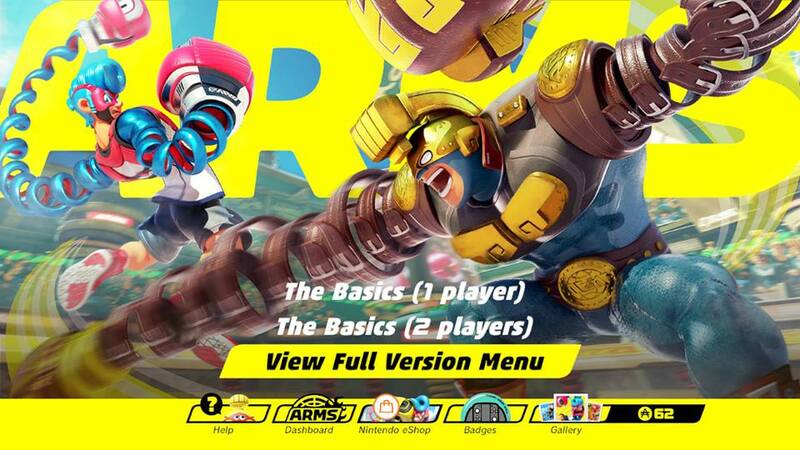 Unlike the ARMS Global Testpunch, the ARMS demo is based off the game's current (and final?) build. That means all of its balance patches and new characters are in, though you can only play as a handful. On the other arm, you can potentially fight all the new characters, controlled by weak CPUs. The main menu of the ARMS demo, with some interesting options. The very way this demo is set up is worth talking about, but first let me explain what's in the demo. You can play with one player or two players. I assume the latter is local multiplayer, but I haven't tried it and never will. The Basics (1 player) gives you a mandatory brief tutorial on the game's controls, and then pits you against two matches of low-level computer players. I assume it's an excerpt from the game's Grand Prix mode. The last option is “View Full Version Menu”, which gives you insight on what options are available in the retail version of ARMS. Trying to do anything from there will tell you it's only available in the full version of the game, which you can buy. The option's verb IS “View”, after all. By LUDWIG VON KOOPA - Oh, and family groups... but that'll get its own dedicated article later. STAY TUNED. 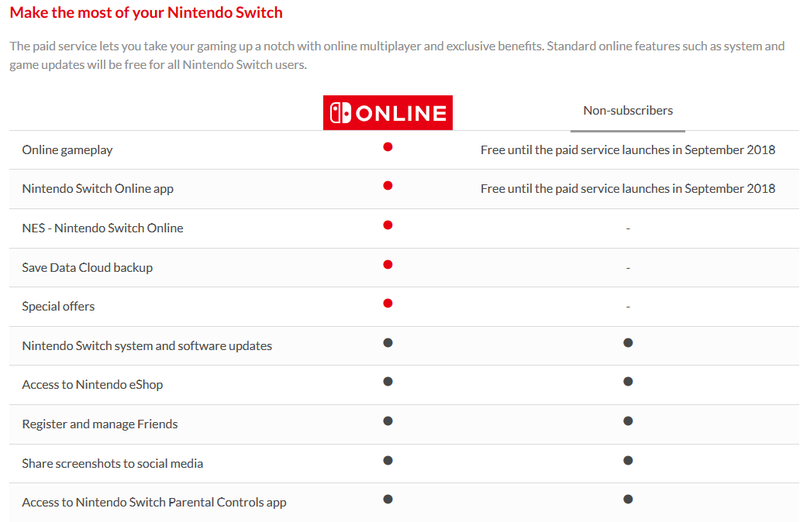 Though I failed to specifically mention it, Nintendo mentioned a week ago in their financial Q&A that they would be providing more details on Nintendo Switch Online in early May. Well, it's early May. Here they are. This table is dated May 10, 2018. Besides the fact that they now find it necessary to say that everyone will get system and software updates for free, there's a new feature. But, first, keep in mind that some of the features got renamed from January 2017 to June 2017. They used to have “Monthly Game Download” and then renamed it to “Classic Game Selection”. They have now settled on “NES - Nintendo Switch Online”, and the specificity of that name change (classic games to specifically NES) implies something about the scope of the free games you'll get. 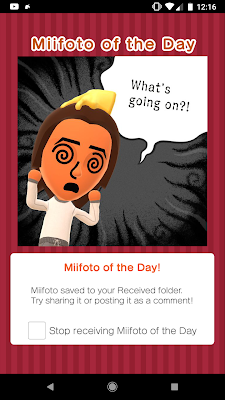 By RAWKHAWK2010 - "#MiiToo", said Miitomo to Miiverse. Before it was announced that Miitomo would be put out to pasture, I hadn't played Miitomo in almost two years. That doesn't mean my Mii didn't at one time get something out of it, though. It enjoyed a fascinating journey through Nintendo's first mobile app, and, unlike Ludwig's, made memories from it that will last a lifetime. 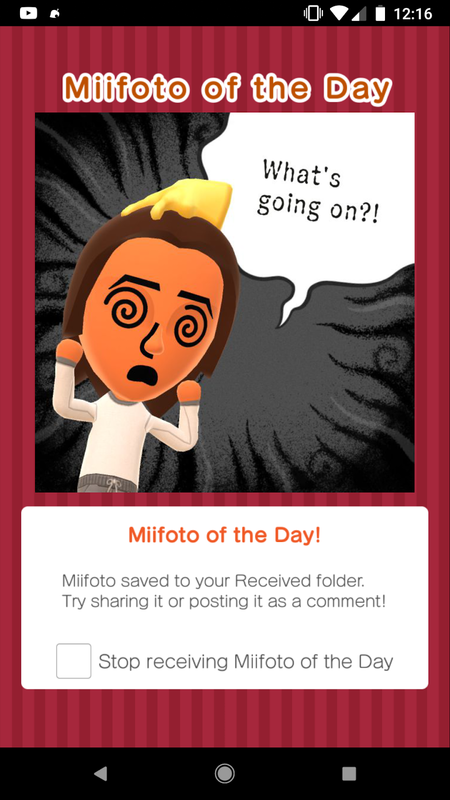 Something important: Miiverse may have had our Miis already doing video game commentary, but Miitomo encouraged them to voice their opinions on literally everything that exists. That was no doubt the most important aspect about Miitomo. Your Mii wanted attention and was gonna find a way to get it. By RAWKHAWK2010 - Colon Cancer. Oh, and Ludwig also claimed subtitles > numbers because the former are easier to remember, but I assure you I'd have a far easier time processing the Mario vs. Donkey Kong series if the numbers hadn't ended at Mario vs. Donkey Kong 2: March of the Minis. Since then we've had Mario vs. Donkey Kong: Minis March Again!, Mario vs. Donkey Kong: Mini-Land Mayhem!, Mario and Donkey Kong: Minis on the Move (which sounds like a gastrointestinal problem), and Mario vs. Donkey Kong: Tipping Stars. I can't tell you which of those are mainline games and which aren't. They might all be but I can't tell you that either. The whole thing's a maelstrom of confusion. 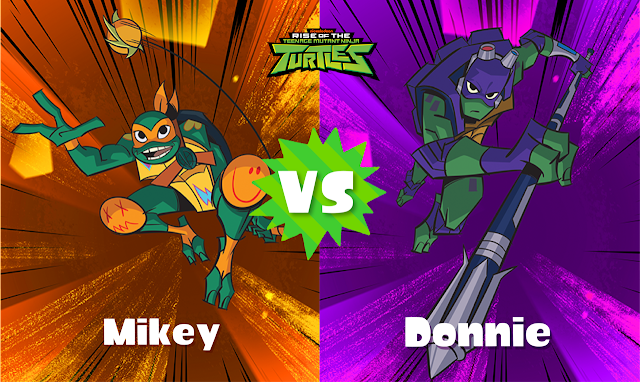 Teenage Mutant Ninja Turtles Splatfest Part 2: Michelangelo vs. Donatello! By LUDWIG VON KOOPA - I'm still sighing, but we DO have an exclusive, timely photograph to go along with this. If you participated in Round 1 of the Teenage Mutant Ninja Turtles Splatoon 2 that was last weekend, you ought to go and collect your Super Sea Snails. Right now. Before Tuesday morning. 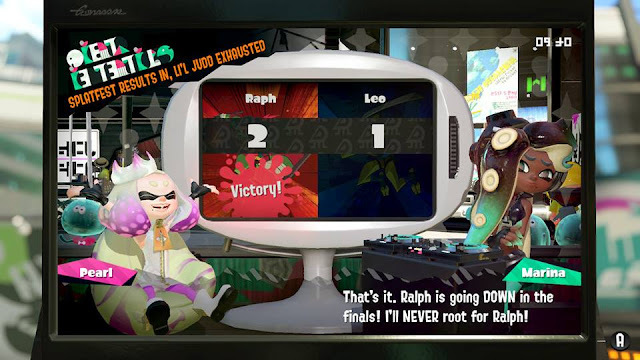 Or they'll go away, because Off the Hook will announce the next Splatfest: Round 2. Yes, I'm writing this article before Off the Hook officially announces the Splatfest, but I know what they'll say anyway. just the cringe-worthy official artwork of Michelangelo vs. Donatello from Rise of the Teenage Mutant Ninja Turtles. 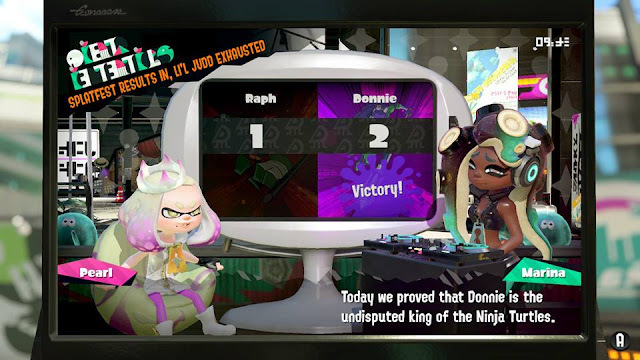 Pearl will side with Mikey, and Marina will side with Donnie. And like Round 1 where I sided with Leonardo (and lost — we'll talk more about that in Round 3's article) and got shoved to Marina's team, I'll be siding with Marina again with Team Donatello as my preferred Teenage Mutant Ninja Turtle. I can explain! Donkey Kong Country: Tropical Freeze is released. Again! By LUDWIG VON KOOPA - You can still get the game on the Wii U. Though you should have done that four years ago. I wanted to write something about déjà vu, but it turns out that while we wrote a lot about Donkey Kong Country: Tropical Freeze before its release, and a lot about Donkey Kong Country: Tropical Freeze after its release, we never published a release article for the game on the Wii U. KoopaTV's infamous February 2014 hiatus prevented us from doing that. Nintendo is generously offering us the opportunity to make up for that unfortunate dark stain on KoopaTV history. So, let's do that. Donkey Kong Country: Tropical Freeze was released on the Wii U on February 21, 2014 for $50. Fantastic game, developed by Retro Studios and composed by David Wise — David Wise's work won KoopaTV's Best OST of 2014. Donkey Kong Country: Tropical Freeze is released on the Nintendo Switch today, on May 4, 2018 for $60. It's just as fantastic as four years ago. But NOW it features Funky Mode, which is where all of the marketing for the Switch version is going into. I'll dedicate a whole article to Funky Mode later, since I think it's fascinating. For now, I want to address two interrelated issues: The game has been removed from the Wii U eShop, and people's general upset reactions. Yoku's Island Express isn't Yoshi's Island... or is it? By LUDWIG VON KOOPA - ...Nah. It's something completely different, but that could be good! You may be watching some of Nintendo of America's videos on YouTube. Perhaps you're watching the mass of Donkey Kong Country Tropical Freeze videos they're uploading, since that comes out tomorrow. Whatever you're doing, you see something catch your eye on the video list, or the related videos on the right sidebar... What is that? A Yoshi's Island game?! See? Second on the left, second row? Yoshi's Island! Let's click on it! Once we get to the video, we're greeted with an ESRB rating of Everyone 10+, and a descriptor of Animated Blood. Yoshi...? What happened to you? ...But it turns out that this isn't Yoshi at all. It's Yoku's Island Express. By LUDWIG VON KOOPA - We learn some things about Shuntaro Furukawa, the next president of Nintendo. To the sub-title's point, we're not just learning some new things about Shuntaro Furukawa, but we're also learning about current Nintendo president Tatsumi Kimishima. Quite frankly, we still don't know much about him, though that'll soon be irrelevant. They were mainly asked about what the investors usually care about: mobile stuff, and geographic expansion. The partnership with Cygames to develop Dragalia Lost, a game we don't know anything about, was of particular interest. (But they loved it.) From the way Furukawa answered the questions, it's clear that he really wants to continue and expand Kimishima's push into putting more Nintendo stuff on mobile trash. At the same time last year, we were announcing that KoopaTV will be returning to a full, five articles a week schedule, up from three articles a week. We are most definitely doing better now than then, and April 2018 was a great April. As you'll see in this newsletter, there are multiple ways that April was great for KoopaTV. Between the rich content, the great comments and participation from you guys (the readers that participate — alternatively known as the players in the KoopaTV game of the KoopaTV Loyalty Rewards Program), and even some site infrastructure updates.